To Cite: Kimiaei Asadi H, Jamalpour M R, Saeedi A. Clinical Trial of Combination of Acetaminophen, Ibuprofen and Caffeine on Pain Relief and Analgesic Use After Impacted Lower Third Molar Surgery, Shiraz E-Med J. 2017 ; 18(7):e13092. doi: 10.5812/semj.13092. Objectives: Relieving a very painful procedure such as impacted lower third molar surgery by combining analgesics into a single product using their synergistic effects is favorable. We designed a prospective, randomized, double-blind clinical trial to study the beneficial effect of the combination of acetaminophen, ibuprofen, and caffeine on reducing the severity of postoperative pain after impacted lower third molars surgery. Methods: This was a double-blinded clinical trial on 108 patients scheduled for impacted third molar surgery. The patients were randomly assigned into 2 groups. Two hours before the procedure the intervention group received combination therapy of acetaminophen (600 mg), ibuprofen (400 mg), and caffeine (15 mg) as pre-emptive analgesia, and the control group received placebo. All patients received gelofen capsules (400 mg) uniformly after the intervention as PRN. Postoperative assessment of pain severity [using a 10-point visual analog scale (VAS)] and analgesic consumption was performed at 2, 4, 6, and 8 hours after the operation. All statistical analyses were performed using SPSS software (version 19.0, SPSS Inc., Chicago, Illinois), with chi-square test or Fisher’s and Mann-Whitney U test. Results: The severity of preoperative pain did not differ before receiving the first dose of study drugs. However, at any time points after the surgery, the mean pain score was significantly lower in the group who received combination regimen than the control group (P < 0.001). In a general linear model, using a repeated-measures analysis, concerning the analgesic dose administered after the surgery, the mean number of doses in 8 hours was 0.96 for the combination therapy group and 1.8 for the control group, with a significant difference (P = 0.022). Conclusions: The pre-emptive combination therapy including acetaminophen, ibuprofen, and caffeine can be used efficiently to control postoperative pain after impacted third molar surgery. Impacted third molar surgery is one of the most common surgical procedures performed in dental clinics worldwide. This procedure, however, can be frequently followed by irritating side effects, most significant of which is postoperative pain (1-5). The literature shows that pain after extraction of a third molar may reach its highest intensity about 6 to 8 hours after operation (6, 7). In the recent years, many attempts have been made to minimize postoperative pain following impacted third molar surgery. Although the delivery of a local anesthetic agent into the tooth socket has been introduced as a novel approach to achieve the most satisfying method for postoperative pain relief (8, 9) in the recent years, this approach might have been consecutively accompanied by some common complications of local anesthetic agents. Many clinicians have emphasized the necessity for better pain control in patients who undergo third molar surgery. Recently, the introduction of non-steroidal anti-inflammatory drugs (NSAIDs) has significantly developed the effective management of postoperative pain in dentistry. Besides, acetaminophen as a non-opioid analgesic with antipyretic properties has been shown to be effective in relieving mild to moderate postoperative pain (10-12). Moreover, caffeine has been added to common analgesics such as acetaminophen or NSAIDs in the belief that it enhances analgesic efficacy, however, evidence to support this belief is limited and often based on invalid comparisons (13). Tramadol is a synthetic analogue of codeine and prevents norepinephrine and serotonin reuptake (14). Among these drugs, diclofenac, tramadol infiltration, acetaminophen and ketamine are totaled to prevent postoperative pain of adenotonsillectomy (15). On the other hand, other studies have defined the beneficial effects of low-dose ketamine not only on postoperative pain, but also in decreasing the needed analgesia after tonsillectomy (16). It has been shown that the combination of ketamine and acetaminophen against acetaminophen singly administered during the operation causes lower pain scores after tonsillectomy in children without added postoperative complications (17). We, therefore, postulated that a technique including combination of acetaminophen, a NSAID drug (Ibuprofen), and caffeine might be effective in relieving postoperative pain after tooth extraction surgeries. The present study aimed at surveying the effect of pre-emptive analgesia on postoperative pain score and analgesic use. It was morally acceptable to not to provide analgesics (gelofen) to the control group before the procedure because it is not routinely done. The efficacy and type of pre-emptive analgesia was the subject of this study and many others. Following the approval of the ethics committee at Hamadan University of Medical Sciences, (ID, D/P/16/71/2/1012) and registered with clinical trials (IRCT cods: IRCT201201078639N1108), this study was conducted on 108 patients, aged 18 to 65 years scheduled for impacted lower third molar surgery at the surgery ward of dentistry college in 2012. This was a block randomized, prospective and double-blinded study. The sample size was calculated based on the non-parametric (Mann-Whitney) test (VAS pain score). Informed consent was obtained from the participants and they were familiarized with the 10-point visual analog scale (VAS) pain score. Exclusion criteria were as follow: age < 18 yrs. or > 65 yrs. ; analgesic consumption prior to surgery; allergic history or any contraindication to analgesic drugs; history of substance misuse; neuropathies and other neurological illnesses; mental illness or language difficulty; evidence of cardiovascular disorders; renal or hepatic failure; and history of significant hypertension or diabetes mellitus. Using the block randomized method, we assigned the patients into 2 groups. Two hours before the procedure the intervention group received combination therapy of acetaminophen (Hakim Company) (600 mg), ibuprofen (Dr Abidi Pharmaceutical Laboratory) (400 mg), and caffeine (Hakim Company) (15 mg) as pre-emptive analgesia, and the control group received placebo. All patients received gelofen capsules (400 mg) uniformly after the intervention as oral PRN. The present study aimed at surveying the effect of pre-emptive analgesia on postoperative pain score and analgesic use. The VAS ranges from 0 = no pain, up to 10 = the worse imaginable pain. The required postoperative amount of analgesic dose for pain relief (gelofen, Dr. Abidi Pharmaceutical Laboratory) was also recorded in both groups. Postoperative assessment of these parameters was performed at 2, 4, 6, and 8 hours after the operation by a dentist who was not aware of the study drugs. Probable side effects were also recorded. Results were presented as mean ± standard deviation (SD) for quantitative variables and summarized by absolute frequencies and percentages for categorical variables. Categorical variables were compared using Chi-square test or Fisher’s exact test when more than 20% of the cells with expected count of less than 5 were observed. Quantitative variables were also compared using Mann-Whitney U test. The trend of the changes in pain score within 8 hours after surgery was examined by the repeated measure ANOVA test. Statistical significance was determined as a p value of ≤ 0.05. All statistical analyses were performed using SPSS software (version 19.0, SPSS Inc., Chicago, Illinois). For this study, we did not receive any funding from pharmaceutical companies. In this study, 54 patients were in the study (combination therapy) group and 54 in the control (placebo) group. The 2 groups were comparable in demographic characteristics. The mean ages of patients receiving combination therapy and placebo were 25 ± 3.5 years and 24 ± 4.6 years, respectively, with no significant difference (P > 0.05). Moreover, 35.2% in the first group and 40.7% in the second group were male, and 64.8% in the first group and 59.3% in second group were female, with no significant difference (P = 0.617). The severity of preoperative pain did not differ before receiving the first dose of drugs (the mean ratings of pain intensity were 3.4 and 3.3, respectively). However, at any time points after surgery, the mean pain score was significantly lower in the group who received combination regimen than the control group (Table 1). Comparing the effect of dental pain relief with student-t test showed that mean pain was 0.9 ± 0.2 and 2.9 ± 0.8 in the control and the intervention groups, respectively; pain scale in the interventional group was significantly lower than the control group after 2 hours (P < 0.001). The mean pain was 3.1 ± 0.5 and 4.4 ± 0.7 in the control and intervention groups, respectively; the pain scale was significantly different between the 2 groups after 4 hours (P < 0.001), but the pain scale was not significantly different between the 2 groups after 6 hours (P = 0.118) compared with student-t test. The pain scale was also significantly different between the 2 groups after 8 hours (P < 0.001). 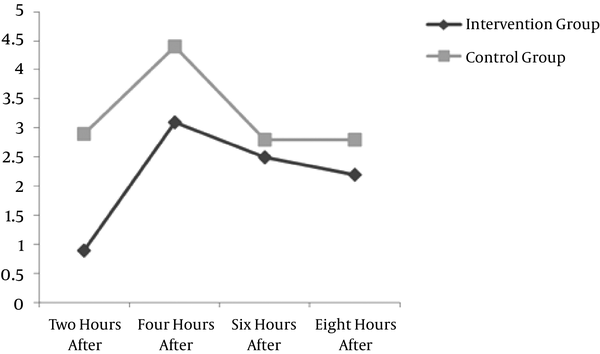 The comparison of mean pain in the control and interventional groups is displayed in Figure 1; this figure shows that the mean pain in the interventional group was significantly lower after 2, 4, and 8 hours. Concerning analgesic dose administered after surgery, the mean number of doses in 8 hours was 0.96 for the combination therapy group and 1.8 for the control group, with a significant difference (P = 0.022). The number of consumable analgesics during 8 hours after the surgery was significantly different between the 2 groups. The mean was 0.96 and 1.8 in the control and intervention groups, respectively. None of the study groups experienced surgery or drug- related side effects (Figure 2). The present study aimed to address the effectiveness of combination therapy including 3 usual and available drugs of acetaminophen, ibuprofen and caffeine on pain relief after impacted lower third molar surgery. According to various observations, moderate-to-severe pain often accompanies third molar surgery during the first 12 hours after surgery, and thus, this time should be considered as a gold time for selecting appropriate medication to relieve surgical pain. Each of the pointed drugs is usually recommended for mild to moderate pain (18); however, the pain intensity associated with removal of impacted third molars is frequently moderate to severe and calls for more effective drugs or a combination of the effective drugs (19). 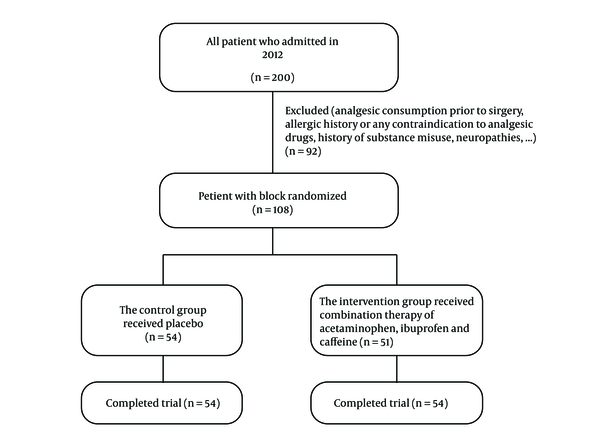 Thus, our study has provided a stringent test for a combination of a novel approach including coadministration of acetaminophen, ibuprofen, and caffeine to examine their synergistic effect on relieving pain within 8 hours after surgery. According to our findings, comparing the 2 groups showed a significant effect on reducing the pain at 2, 4, and 8 hours after surgery based on VAS pain score. In a similar study, ibuprofen management significantly reduced pain at 4 and 8 hours after surgery (20). Moreover, Wells et al. (2011) compared the use of ibuprofen against ibuprofen/acetaminophen to reduce pain in a randomized double-blind study and found a decrease in pain levels and analgesic use over time for both groups (21, 22). This combination therapy was very effective in decreasing pain score, needing an analgesic dose after surgery, and increasing drug tolerability. With respect to the beneficial effects of caffeine in relieving pain, several studies have been conducted with a wide spectrum of efficacy. In these studies, the most common pain conditions studied have been postoperative dental pain, postpartum pain, and headache and they concluded that the addition of caffeine with the dosages higher than 100 mg to a standard dose of commonly used analgesics could achieve a good level of pain relief (13). Recent studies have demonstrated that caffeine acts as an analgesic adjuvant when combined with acetaminophen, aspirin, or their mixture. In a study by Forbes et al. the effects of different regimens including a single oral dose of ibuprofen (50, 100, or 200 mg), a combination of ibuprofen with caffeine, and a combination of ibuprofen with caffeine were examined, and it was found that all active treatments were significantly superior to placebo, and the caffeine effect was significant for every measure of analgesia. On the other hand, the combination had a more rapid onset and longer duration of analgesic action (23). It seems that the analgesic adjutancy of caffeine clearly extends to combinations with NSAIDs drugs other than acetaminophen. We believe that a combination product containing acetaminophen, ibuprofen, and caffeine is a safe and cost- effective treatment for pain relief in impacted lower third molar surgery and can provide significantly superior efficacy and speed of onset compared with using each of these drugs. Because of the inflammatory nature of pain appearance in different types of surgeries, reduction of postoperative inflammation can effectively result in postoperative pain relief (24). By pharmacologically controlling the inflammatory process, the intensity or severity of postoperative squeal such as pain can be reduced (25). In addition, because prostaglandins play a major role in the induction of pain, the reduction of biosynthesis of prostaglandins by inhibition of the cyclo-oxygenase enzyme system is considered an important mechanism for postoperative pain relief. This goal can be achieved by the use of NSAIDs so that the administration of these drugs preoperatively leads to combating postoperative pain (26). Because ibuprofen is less expensive and requires a reduced amount of nursing time to distribute, the use of this drug combined with acetaminophen and caffeine is preferable to other medications (26). This study illustrates the enhanced effects of coadministered acetaminophen, ibuprofen, and caffeine with standard dosages on postoperative pain in lower third molar surgery. Larger sample sizes should be performed considering drug interactions and efficacy of each drug alone. This study was supported by Hamadan University of Medical Sciences. We thank the University authorities who offered critical administrative support and managerial services in helping us to conduct this the study, and we also thank all researchers for their help and support. Conflict of Interest: The authors have no conflict of interest (none to declare).